﻿ ﻿ In 1887, the cornerstone was laid and construction proceeded at a rapid pace. Many prominent citizens of Lima and organizations not affiliated with the Church also contributed to the cost of the project which was $14,000. It was a splendid example of Gothic architecture, with a majestic steeple 135 ft. in height, including a tower with a great resounding bell. The new Church was formally dedicated on January 8, 1888, with services conducted in both German and English. Our founder Rev. Peter Greding and several other visiting Pastors officiated programs and services on that day. 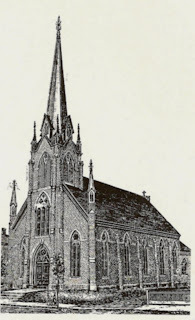 For many decades the tall spire of our Church stood as a landmark in downtown Lima, OH. Unfortunately on August 25, 1936, a severe windstorm damaged the lofty steeple and it was removed. Thankfully, the great bell was spared and still summons Christians to service with its glorious resonance. Although the structure has been transformed and renovated throughout the years, our Church people maintain the fundamental Faith in Jesus Christ our risen Savior. 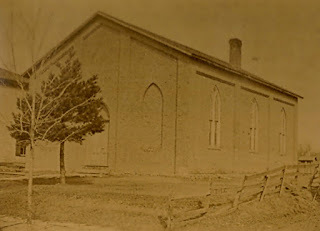 In 1864, land was purchased from Hudson Watt at the cost of $400 to build a new Church on the the corner of Wayne and West Sts., located just beyond the Lima town limits. It is upon this ground our Church still stands today. The Church was a plain 36 x 50ft. brick rectangular structure, seating about 200 people. The windows were not stained glass. Primitive on the inside, with a wood floor and crude benches. There was an aisle on each side of the small auditorium with a broad section of pews in the center. Very short pews were placed alongside the walls. It was customary for the men to sit on the east side of the church, and the women on the west side. Eventually the families would sit together. Two wood burning stoves provided heat, and oil lamps suspended from the ceiling provided dim lighting. There was no organ or musical instruments. Often a beautiful rosewood melodeon owned by Mrs. Anna Herold Zimmerman and Mrs. Margaret Herold Sullivan would be transported to and from church for special services and Holy Days. There were no offering plates. But instead, "Klingelbeutals" or black velvet "jingle bags" were attached to an 8ft. long stick used by the Deacons to collect the tithes, reaching across the people in the pews. Sometimes these sticks were used to gently tap the sleepyheads nodding off during service! The final cost of the building project was $3000. The Ladies Aid Society was organized on January 3, 1867, for the purpose of raising money to pay off the debt, which they did successfully. 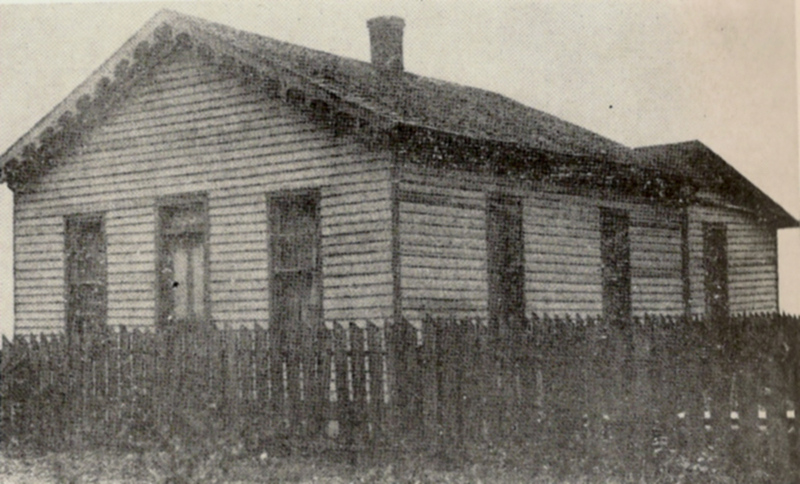 The small simple structure was dedicated on May 10, 1867. And with the new building, came about 85 total Church members. Though the name of our building has changed many times on paper, in our hearts and souls the Church body has always been known as Believers in Christ! On September 5, 1863, as dusk descended upon the growing Lima community of about three thousand people, the shrill whistle of a train on the Pittsburgh, Ft. Wayne, & Chicago Railroad could be heard in the the distance. These were the dark days of the Civil War. The Battle of Gettysburg had been fought two months before, in the shadow of the beautiful mountains of Pennsylvania. There would be the dedication of a National Cemetery on that hallowed ground in a few weeks, where President Abraham Lincoln gave his now infamous Gettysburg Address. The Lutheran Meeting House, located on the west side of North Union Street and about 125 feet north of East High Street, was seeing a spurt of activity lately. This little building surrounded by a picket fence, formerly used as a schoolhouse, had become the regular worship place for a congregation of German speaking immigrants. As the group gathered on this evening, the sound of a gavel brought the assembly to attention. Rev. George Rettig, recently from Bucyrus, Ohio acted as clerk and Mr. Karl Lang presided. 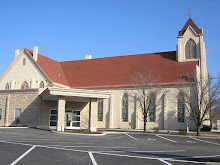 In a bold step forward, the group officially organized themselves under the chosen name: "The German Evangelical Reformed Congregation of Lima, Ohio." A Constitution consisting of four articles was also adopted. The original document of organization, written in both German and English by the first pastor Rev. George Rettig, still exists in our archives. With the influx of German immigrants coming to America around the year 1850, many of these families settled in the north end of small town Lima, Ohio. The newcomers often felt isolated living among English-speaking strangers, and lost without worship since a German church had not yet been established. Bonding together they eventually began convening in homes, schoolhouses and other places opening doors to the foreigners. An ambitious young man named Rev. Peter Greding stationed at Riley Creek near Bluffton, Ohio, heard about the plight of this group and diligently helped them organize a church congregation. Traveling 15 miles from Bluffton by horseback or buggy requiring roughly four hours of travel one-way depending on the weather, he conducted regular services in the German native-tongue at Sanford Hall between 1859-1863. He also organized a choir which rehearsed on Saturday evenings to prepare for singing the anthem on Sunday morning. And for about the next 20-years continued to work closely with the church, editing German lesson materials for Sunday School. According to the History of Allen County, OH (1885), Peter Greding was born in Thusis Graubunden, Switzerland, February 28, 1837. After his father died in Switzerland, Peter and his sibling came to America with their widowed mother in 1858, and settled in Milwaukee, WI. Highly educated, graduated in his homeland from the Cantonal College in Chur; and studied the English language and theology at Heidelberg College and Seminary in Seneca County, OH, where he later became a Professor. Peter Greding was ordained a minister of the Reformed Chuch in 1859, the same year he came to Allen County, OH. He married Anna Matter in 1860, and they owned & operated a farm on 133 acres. Their children: Lydia, Jennings, Calvin, Emma, Bertha, Clara, Amelia, Leander, and Hulda. Rev. 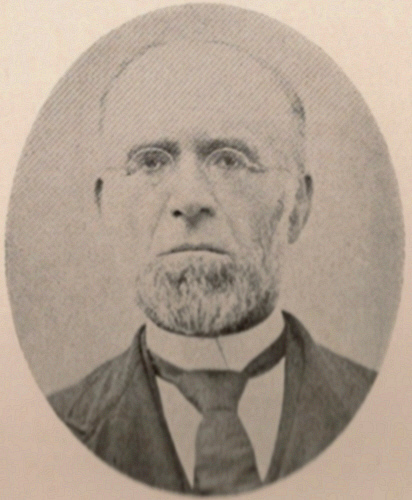 Peter Greding died on April 28, 1910 at the age of 73. Funeral services were held at the Lima church he founded, burial in Bluffton. Welcome to the First Evangelical & Reformed Church Historian's blog. A virtual journal spanning over 150 years! Providing a glimpse into our archives...records, artifacts, anecdotes, and photos highlighting the vivid history of our congregation. We appreciate your interest. Feel free to comment or ask questions. Christians are a history-centered people. From the ancient times of Levite scribes we have cherished Biblical creeds, writings & testimonials as fundamental accounts of God's omnipotent power. Because religious documentation around the globe often precedes civil records by centuries, Church records are among the foremost vital proofs of our human existence...birth, baptism, catechism, marriage, death...along with study, fellowship, and benevolence. These registers are also prime sources tracing family relationships. The preservation of Church history is our spiritual lifeline, reflecting the faithful commitment of Christians throughout the generations. Following in the footsteps of those who have gone before, let us recall their legacy as we walk forward with Jesus, spreading the Good News.